They were heavy, uncomfortable and not much good against bullets, but there was no doubt that a cuirass was a status symbol. Of course plate armour on a mounted man dated back to the middle ages and before, and by Napoleon’s time most cavalry were unarmoured, but the cuirassiers saw themselves as the elite of the cavalry, and the cuirass was the obvious symbol of that position. With their metal helmet and cuirass front and back, the look of the French cuirassier that appeared on the field of Waterloo had largely been set by the time of the Emperor’s coronation in 1804, and it is this iconic look that is represented in this set of figures. The box title mentions summer dress, but this really just means 'without the coat', which is the usually depicted form of dress anyway. All the recognisable features of the cuirassiers’ uniform are here, including the helmet with plume and mane, tunic, cuirass and boots. Plumes were detachable and often taken off when action or bad weather approached (or covered for protection), but all these figures have them on full display. Purists will want to know that the coat tails are very short, marking this as the 1812 habit-veste, which dates these figures to that year or beyond, although once mounted such details are lost anyway. All the troopers have a crossbelt supporting a cartridge pouch that bears a grenade badge which seems to have been discontinued after 1812, so some may wish to trim this off. In general though there are no issues with accuracy. 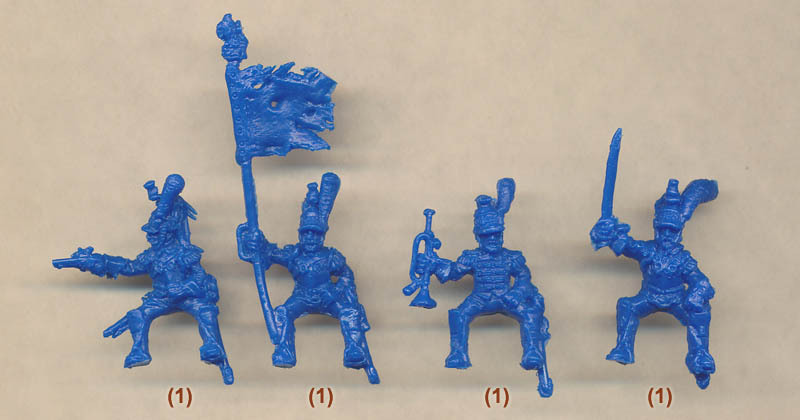 Another feature that helps to date these figures is that all except the officer, trumpeter and standard-bearer carry a musketoon. This was first issued in 1812, so again these are really late war figures. Well before that date cuirassiers had pistols such as that handled by one man, and of course they all had the long heavy sabres. A short time before this set was released Strelets released their Borodino set which included similar cuirassiers. Those figures were mostly sedentary, perhaps on the march or awaiting orders on a battlefield. With this set Strelets have introduced much more action, with swords flying and firearms discharging, making this a much more dramatic collection. We liked all the poses except for the man firing his musketoon (second row, last figure). He is firing across his chest and without supporting the firearm, which would have greatly reduced the likelihood of hitting any target. Firing from the saddle was never easy or particularly accurate but we felt this pose was not particularly well done, although we applaud the concept of a pose using this weapon. The horses are the same as those in the Borodino set, so are correctly saddled and a fair range of poses. None seem to be at the full charge, which is not a great problem but it would have been nice to have at least one such pose. With the horses also we noticed that several seem to lean markedly to left or right, making the model with rider rather more unstable than usual as well as looking rather odd. These figures look to have the same sculptor as those in the Borodino set, and as we said then the stocky Strelets style works particularly well for such men. However they do both share some problems in the detail. On some poses the crossbelt is too high on the body, being fully under the cuirass strap and making it impossible to secure, suggesting the sculptor did not understand their function. Also in this set more detail is missing, but only on certain poses. Some for example have no tuft on their helmet crest (certainly helmets were damaged while on campaign but we would prefer to choose which items to damage or remove ourselves). Swords and scabbards are again very short, and the musketoons also suffer noticeably from a similar problem. Tricky items such as the eagle on the flag staff are not well done, although the always difficult mane on the helmet is not too bad here. As usual there is no flash, but the men fit their horses rather too tightly in some cases, making it tricky to keep rider and animal properly together (rather than just 'popping off'). The flag, which is unengraved but a bit over large, has been done with considerable damage. This is perfectly realistic but again some may prefer to have chosen that for themselves. While nowhere near the attractive sculpting of the Esci/Italeri figures these cuirassiers do convey something of why these men were called heavy cavalry and will match the other Strelets Napoleonic sets very well. French cuirassiers are a subject that is often called for by customers so these will doubtless thunder across many a tabletop.